President Park Geun-hye said Monday that she is prepared to meet with North Korean ruler Kim Jong-un and Japanese Prime Minister Shinzo Abe. However, she came up with conditions to be met in advance before she would get together with the heads of the two estranged neighbors for the first time since her inauguration last February. “To achieve peace on the Korean peninsula or prepare for reunification, I will stick to my previous stance that I am willing to meet with the North Korean leader at any time,” Park said in her New Year press conference, . 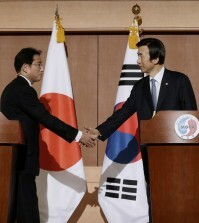 As the first step to improve inter-Korean relations, Park proposed a reunion of family members separated by the Korean War (1950-53) timed for Lunar New Year’s Day later this month. The two Koreas agreed to hold a reunion last September for the first time in three years, but Pyongyang cancelled the humanitarian event just four days before for dubious reasons. The country’s first female chief executive also did not rule out a meeting with Abe, whose provocative remarks and activities have dampened ties between Seoul and Tokyo. 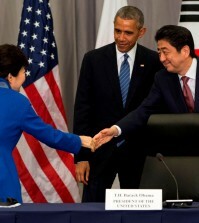 “Since taking office, I have wished to improve the relationship between Korea and Japan. And to build mutual trust, I have stressed an appropriate historic view and a sincere attitude,” Park said. 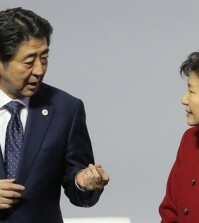 Park added that, “I never said that I will not meet the Japanese leader.” But she said that stringent preparations were necessary to enable win-win results for both countries. She was apparently referring to Abe’s recent visit to the Yasukuni Shrine, which honors the dead from World War II and houses the remains of 14 Class-A war criminals. The visit angered not only Korea and China, victims of imperialist Japan during the Second World War, but representatives of other countries around the world. 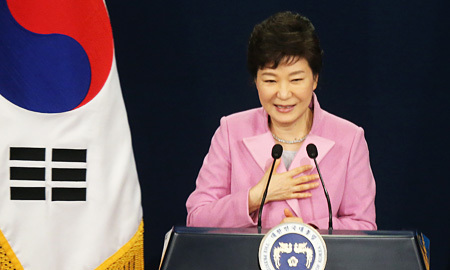 Park also said that the government will go all-out to revitalize the economy in 2014 by launching a three-year project aimed at substantially jacking up national output — she presented targets of topping $30,000 in gross domestic product (GDP) per capita and a 70-percent employment rate by 2016. Toward that end, she crafted three action plans addressing all irregularities, like overly generous benefits at public firms, accelerating her flagship policy of attaining a creative economy and boosting domestic consumption. “Due to prohibitively high costs, some seem to be satisfied with the status quo of separation. But reunification is a ‘jackpot’ for us as shown by the fact that famous investors vow to invest all of their wealth in Korea after reunification. Our economy will be able to rack up a quantum leap,” she said. 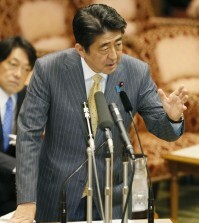 To prompt foreigners to invest more in Asia’s No. 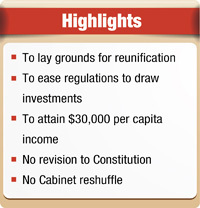 4 economy, Park pledged to review all regulations now in place. Asked about her stance on the ongoing talks on revising the Constitution, which was established in 1987, Park was against the idea so as not to divert the attention of the people away from economic issues.